Streeter Lecka/Getty ImagesGold medalist Yang Zhou in Sochi. With nine months still to go before the International Olympic Committee votes on a 2022 Winter Olympics host, there are only two cities left in the running: Almaty, Kazakhstan and Beijing, China. Beijing is the favourite by default, despite IOC concerns about snowfall, travel, and winter sports experience. In May the IOC released a report on the three remaining bids — Oslo, Beijing, and Almaty. The IOC graded the bids from 1 to 10 in 14 different categories (venues, transportation, safety, etc.). Oslo was the clear frontrunner. They got the best average maximum scores (8.9 out of 10), Beijing got the second best (8.3), and Almaty got the worst (7.3). In a blow to the IOC, Oslo dropped out in October, joining Stockholm, Krakow, Davos, and Munich on the list of potential democratic host cities that pulled their bids over financial concerns. That leaves Beijing as the new favourite, but that doesn’t mean the bid is flawless, far from it. 2. Nearly half the venues will have to be built from scratch. Beijing says 54% of the venues already exist and the remaining 46% of venues will be permanent if they win the 2022 Olympics. That’s not a good thing. As we’ve seen over and over again, building permanent venues for niche sports that have no utility outside the two weeks of the Olympics is wasteful and can result in white elephants. 3. A cluster of venues for some mountain events is three hours away. 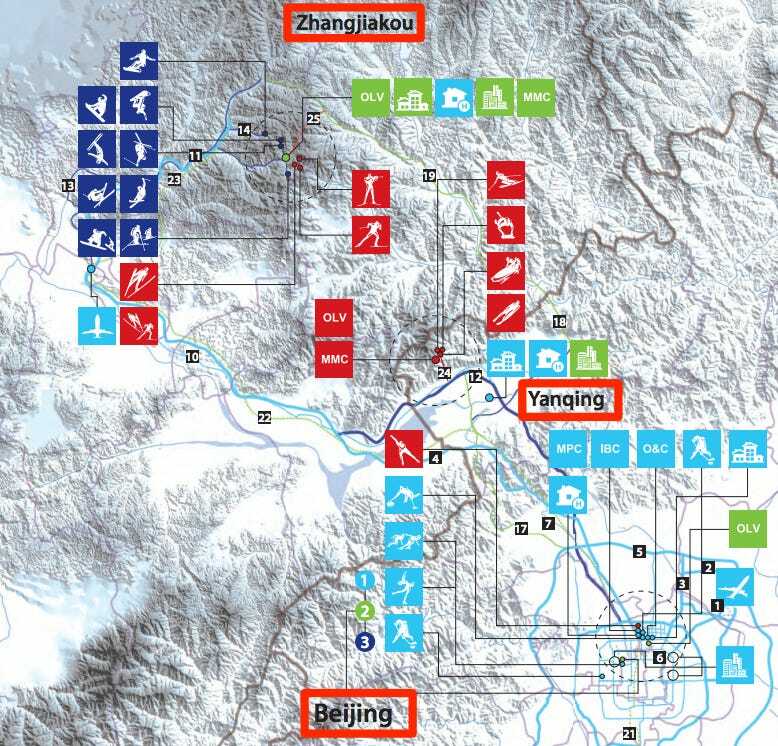 Events like biathlon, cross-country skiing, and ski jumping will take place in Zhangjiakou, which is a 2 hour, 44 minute drive from Beijing. The other mountain events will be held 90 minutes outside the city. 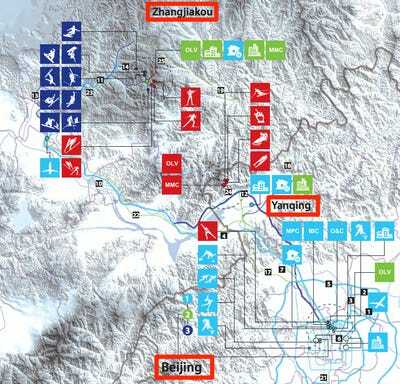 IOCThe proposed map of Beijing Olympic venues. Hopefully Beijing will learn from Sochi when it comes to building Olympic hotels on time. The IOC report gave each bid minimum and maximum scores in the 14 categories. A score of 6 out of 10 is considered the benchmark. In the categories for competition venues (5.5) and transportation (5.0), Beijing’s minimum scores were below that benchmark. Oslo hit the benchmark in every category except “government support” (which turned out to be 100% justified since the Norwegian government killed the bid). Almaty failed to hit the benchmark in 9 out of 14 categories based on minimum scores, which tells you why Beijing is such a big favourite. The bidding process for the 2022 Olympics was a disaster. The IOC knows this. That’s why they’re trying to implement widespread reforms before the 2024 bidding process kicks into high gear. Beijing might be the frontrunner, but they’re not the city the IOC wanted.